Affiliations: The Intercosmic Peace Corps; Joe Cleancut of the I.P.C. Base of Operations: Mobile throughout the solar system, but based out of his "ordinary hippie pad". Powers/Abilities: Able to fly (even between planets). His "superkiss" is so potent that any woman he kisses becomes unable to do evil deeds, as they are overcome with love for their fellows. He is allergic to grass. 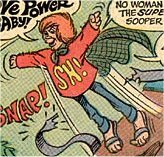 History: Stanley Humbert is the heroic Sooper Hippie, who sometimes assists the Intercosmic Peace Corps, such as when they ask for his help because Mary Boppers, the Bad Space Lady is messing their Mars Irrigation project. The Corps has their agent Joe Cleancut teaching the Martians how to dig canals so that they can irrigate their lotus fields, the Martians main food source. Arriving on the red planet, Sooper Hippie is temporarily caught in a canal filled with quick drying cement (Mary Boppers' evil work), but manages to escape and set off in pursuit. Tracking her to her space bungalow, he is captured by one of Mary's man-eating flowers, and awakens strapped to a metal bench. She threatens to kill him by exposing him to grass, which he is deathly allergic to, but grants her captive a final request for a kiss, little realising this will expose her to his personality altering "superkiss", instantly reforming her. Comments: Drawn by Howie Post.